...that if I knit a pair of socks every other month (which is my 2009 goal), it will take me 5 years and 8 months to get through my current stash of sock yarn? ...that I have enough yarn in my stash for 13 different wraps/scarves? ...that I am a rediculously slow knitter that actually bought 11 skeins of some unknown (yet expensive) yarn at a horrible store in NYC because I was inspired to knit a blanket? Clearly, I have issues. 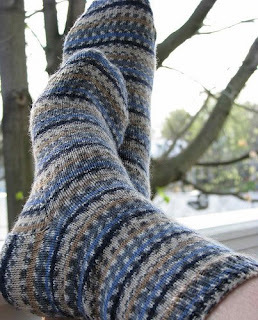 But I did finish my socks for Joe this weekend.